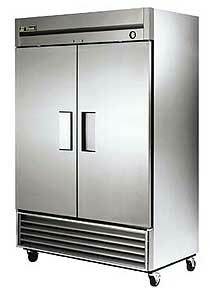 True T-49F Reach-In Freezer- 2 swing doors. 6 shelves. 3/4 HP, 14 Amps. 54"L x 29-1/2"D x 78-1/4"H. Self-closing doors. Stainless steel front. Anodized aluminum finished ends, back and top. White anodized aluminum interior with stainless floor. Oversized and balanced environmentally friendly refrigeration system. 4" swivel castors. Door locks. Adjustable vinyl-coated wire shelves. The new HC model features the latest in energy efficient technology with R290 Hydrocarbon refrigerant that hat has zero ozone depletion potential (ODP) and three global warming potential (GWP), as well as 3 Low-E thermal glass hinged doors and a foamed-in-place cabinet that uses a high density, polyurethane insulation. True's 5-year compressor warranty. Oversized compressors have less run time so they will last longer. Specially designed low velocity fan motors allow faster recovery with less energy usage. Every unit is factory tested for 4 hours before leaving the factory, Freezers up to 16 hrs. Authorized service companies in every city. Parts readily available for all models. True Refrigeration has been a leader in the industry for over 65 years. High density foamed in place insulation has unsurpassed R factor. Glass door models have triple pane glass. Fan motor life expectancy 15 - 20 years. Made in America employing ( 1500 - 2000 ) people in 5 cities. Low prices and quick ship time.